Captain Bligh was a good man! the correct name was HMAV Bounty. There were small cannons on the ship, making it an 'armed vessel'. William Bligh would ever command. It had a very small crew of only 46 men. He was officially a lieutenant, working for half the pay of a captain. (And that was the source of some of the problems). The men could call him Captain out of respect. William Bligh was 33 years old. on an earlier voyage with Bligh. They both respected the other. 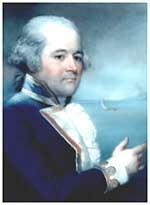 The crewman had spoken highly of Bligh as a commander. Bligh recommended him for the Bounty and genuinely liked him. had 'danced Bligh's children on his knee'. That crewman's name... was Fletcher Christian. like he really did look like actor Clark Gable. Charles Laughton as Captain William Bligh. who actually played a role in the 1935 'Mutiny on the Bounty' film. who played the role of the real life Maimiti (Fletcher Christian's love). Marlon got a divorce and married his new love. October 26, 1788, the Bounty arrived at Tahiti. (the short way), the Bounty sailed 28,000 miles. to remain in Tahiti much longer than planned. April 4, 1789, the Bounty departed Tahiti with 1015 breadfruit trees. At 5 AM, Bligh is asleep in his small cabin. His door was open, as it had been throughout the voyage. 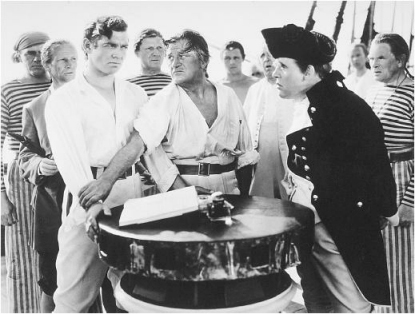 Suddenly, Fletcher Christian and other men grab Bligh, tying his hands behind him. He is led past men with firearms and swords and taken to the deck. Bligh said, "Mr. Christian. You have danced my children on your knee". "I have been in Hell. 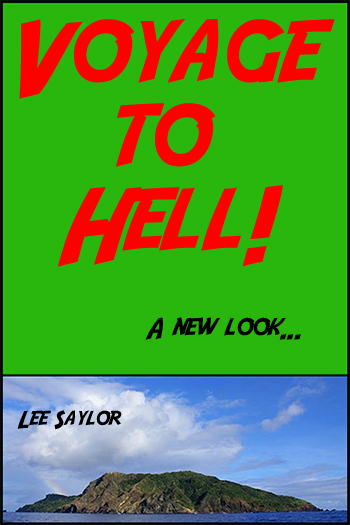 I have been in Hell." 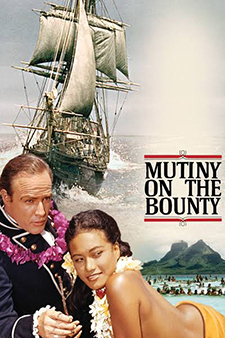 Captain Bligh did indeed act irrationally when the Bounty left Tahiti. But they had spent over five months on that Island. He just wanted to get home to his wife and daughters. Sailors knew that life on a boat was hard. They knew that mutiny was punished by hanging. and be free to do whatever they wished, including returning to Tahiti. but Fletcher Christian was mentally unstable. seriously considered building a raft and floating away? He was not thinking clearly; he was actually suicidal. Months later, many of the mutineers hated him for talking them into a mutiny. that was just 8 inches above the water line. that they would all die. They began a 3618 mile journey, which took 49 days. Somehow, with the loss of only one man, they succeeded. Bligh would return to England as a hero. Later, he would see his name and reputation destroyed. did not go directly to Tahiti. The mutineers went to the Island of Tubuai. There is a major story concerning the mutineers and this Island. the movies have never shown this. Over 80 natives would die. and the Tahitian people were outraged. The movies always got it wrong. starring Clark Gable and Charles Laughton. in the most expensive rendition of the story. The film went millions over budget. starring Mel Gibson and Anthony Hopkins. Regardless, the story that these films depicted was completely wrong. Captain Bligh was not a madman. He treated his crews better than most British Captains. And Fletcher Christian... was not a hero. Here's a scene from the Mel Gibson and Anthony Hopkins film, 'The Bounty'. It's far and away more accurate than any of the other films. named Daniel Day-Lewis and Liam Neeson. Mel Gibson described Fletcher Christian. "He was a 24 year old kid, and he was acting like one." Fletcher Christian did not get off the boat. with the mutineers... were kidnapped! The Bounty departed Tahiti on September 23, 1789, with 9 mutineers. elected to stay on Tahiti and take their chances). 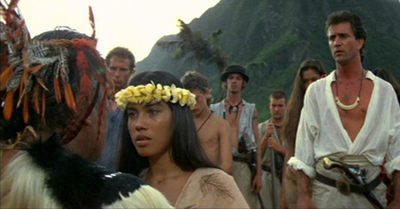 Along with them were twelve Tahitian women and six Tahitian men. Do the math; you can see that there will be a problem. There were more men than women. A woman named Jenny spent 30 years on Pitcairn Island. She related this account in 1829. There is no reason to think that she is not telling the truth. called by the natives Purutea. A canoe came off, bringing a pig and cocoa-nuts. (Natives approached the Bounty with gifts). who, in a very friendly manner, gave the man the jacket. when one of the mutineers shot him dead. He fell into the sea. having lost all authority, than reprimand the murderer severely." I invite you to read my book from Amazon. Forget about what you've seen in the movies.